Gmail's blog announced that three experimental features have graduated from Gmail Labs: superstars, nested labels and advanced IMAP controls. There's also a Gmail Labs feature that will no longer be available: the Google Search box. 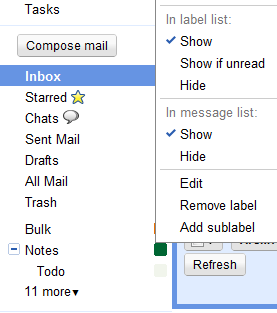 Superstars extend Gmail's starring feature by adding different types of stars for flagging messages. For example, you could use the red exclamation mark to flag very important messages and the orange quotes to highlight the messages that need a reply. The feature is not obtrusive since you can trigger it by repeatedly clicking a Gmail star. You can go to Gmail's settings page to customize the list of stars. Nested labels have improved a lot since Google added this feature to Gmail Labs. You can add sub-labels from the menu, quickly rename or delete sub-labels, pick a sub-label from a hierarchical list when you create a filter. Nested labels are still a hack and there are many issues that need to be addressed so that users no longer notice the implementation details. For example, messages that use nested labels don't inherit the parent label. Advanced IMAP controls are only useful if you want to customize Gmail's IMAP features when using mail clients like Outlook or Thunderbird. You can disable auto-expunge and ask Gmail to wait until the client updates the server, delete messages instead of archiving them when you mark a message as deleted and limit the number of messages from a folder. Nested labels makes labels more like the 'collections' used in Google Docs, but still different. Wish they would bring some degree of consistency to their services. Is it that they don't pay enough attention to the experience of the novice user or that there is no one really in charge who can force the different service groups to cooperate? I think the Web Search box has potential. It could have done what Hotmail does with Bing and allow users to insert a lot of content, like photos, maps, videos, and other search stuff into messages. I sent a few suggestions when the lab came out to make it more like Hotmail's From Bing feature but nothing came out of it. I remember though seeing in one of your posts a screenshot of what looked like a similar feature but I think it's been being tested. Lacking sub-folders is a really-REALLY blocker for people migrating files from their computers/phones to the cloud, dear google. And one suggestion more: you need improve filters with superstars. Now it is possible "star it", but it would be better "star it with red star"
Nested labels are still a hack and there are many issues that need to be addressed so that users no longer notice the implementation details. What about showing only recently used sublabels in the visible label list? Does not seem to work anymore once a top label has been created. Worse, a top label cannot be deleted without deleting all sublabels, also. Any hints? i can't wait for Super Stars to be supported in Google apps for iPhone. @manuelvh: I completely agree with this. Superstars in filters would be a blessing. It would be nice if you click on the Parent label, you would see all messages labeled with children labels as well. Right now, you only see ones labeled with JUST the parent label. I don't think this makes sense, as the only feature you added is the ability to organize the label box, and not really any functionality in actually using such hierarchies. Wish I could un-nest my labels. Nested them when it was still just in labs, don't like the way it's set up.